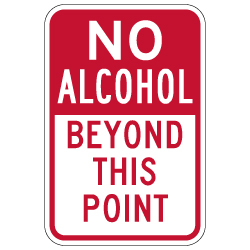 NO Alcohol Beyond This Point Signs - 12x18 - Rugged rust-free aluminum signs for indoor or outdoor use. Made of heavy-gauge reflective aluminum with anti-weather and anti-graffiti protection Available. Maintain good boundaries! Use this indoor or outdoor rated rugged aluminum No Alcoholic Beverages Beyond This Point Sign in bars and restaurants with outdoor areas, city parks, campsites, beaches, schools, or other areas you wish to restrict the use and consumption of alcohol. There's a time and a place for alcoholic beverages -- and sometimes NOT.